I thought they would perform better when enduring a nail or something. Love these tires - very quiet, comfortable, and car handles well. I have owned this car for 4 years - it came with a set of these and I've replaced them once, ready for another set. Very disappointing. Warranty to 90k when bought but at 65k my tires are worn out and need to be replaced. How does that work?? The tread is at 3/32. Bought the car preowned with these tires and I've since driven on two sets of these tires for 90,000 miles combined and they handled great with a very quiet ride. No road noise at all. Ready for another go around. It does great for me. I purchased this car with 20,000 miles on it. I have driven it a year and rotated the tires every 3,000 miles. It now has 29,850 miles and I need to replace them. WOW...Overall I like the tire, but I need ones that will last longer than that. This is a pretty decent tire if you don't want to spend a whole lot of money. Can't complain. Would recommend. Always been happy with the quality of Continental tires. These were original tires and I replaced them with same before getting a new car - which also is equipped with Continental tires. Great ride and handling for a fair price. Came on my new 2014 Subaru Outback. At 10,000 miles, I mildly bumped curb with rear right tire -not even a super hard bump. Had a bubble form 300 miles later (and of course 3 hours from home)--all highway driving. Drove home the 300 miles (all highway again) and bubble expanded to 1" wide x 5" long. Very disappointed that I find myself replacing a tire at such low mileage. I am a careful driver, never having had an accident, and stick to the good roads. Makes me wary to take it "off road" next summer. Disappointed and only buying another one cuz I have 3 new ones still on the car. These tires came stock on my car. They are very worn now at 50k miles but held up well. I am exceptionally pleased with dry weather grip and handling. Wet weather is very good, but these tires offer no grip in the snow. I live in suburban/rural New York and see a bit of snow through the winter, so I'm seeking another tire. For someone in a milder climate or looking for a great summer tire, I would highly recommend this tire. If you're putting in decent mileage in a winter climate, pass these tires up. After about 500 miles, I am very happy with this tire. No issues at all in ride or handling. Very quiet and soft. Came stock on my VW CC. Within a month one tire's sidewall had a bubble on it. Replaced the tire and within six months another tire had a sidewall bubble on it. It's now been 28k miles and three tires have sidewall bubbles. Wow Continental, when did you start making a garbage tire?? No snow here yet to determine traction. Tires wear well and handle good. I bought a new Honda Odyssey in 2012 with factory Continental tires. I have not been impressed. 32,000 of in city driving and the tires are already at 3/32, which means they need to be replaced. I have owned many brands but this one has lasted the least amount of miles of any. 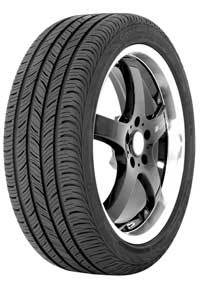 Excellent tires - very smooth and quiet and great handling. You barely have to adjust for rain. Snow traction isn't bad for an all-season but I run snows in winter. I tend to be kind of hard on tires and have almost 75k km/45k miles and they're still going great. Tires are worn out at 35000 miles, and I am not a hard driver as evidenced by 47 MPG until the winter came and the Versa would not heat. This dropped the MPG down. I am back to 43.5 average and climbing now. The snow and ice traction is dismal. I have 67,000 miles on this set. Still have tire life left but I start early studying for tires to buy. It will be this kind again. Longest lasting tire I've ever owned. Low snow traction rating due to no snow in the south. These have thin sidewalls, had one fail after bumping a curb. Also, they are not very good in the snow and pick up gravel because the tread is too close together. These came with my Accord. STS has always been very good and I'm sure they would have replaced the tire, but the dealership provided me nothing. Fast services and reasonable prices. Excellent tires to get the best out of your car. Great for highway driving and awesome for winters. Awesome Tires for the price range. Great service experience. Definitely recommend for their professional service! This tire has a very thin sidewall. I have replaced the same tire twice now, when it failed after hitting a curb, while making a sharp turn out of a parking lot. The sidewalls are like eggshells. I'm 66 years old, and I've never had a tire fail before just from scraping up against a curb. These have unacceptably thin sidewalls. Very pleased with the product and durability of these tires. Not mention, the price was very reasonable! Best all season tires I have ever had, love the wet traction. I run snow tires during the winter.